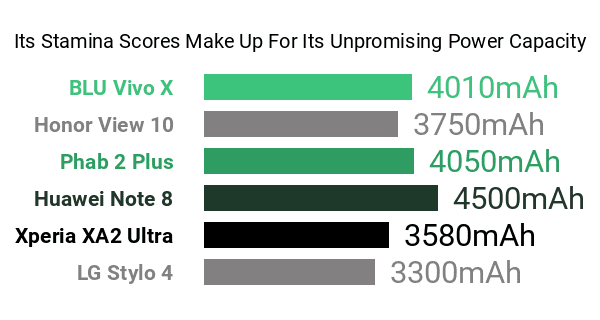 The LG Stylo 4 is a mid-level wide-screen smartphone whose assortment of pros and cons is loosely based on that of the Q Stylus, a higher-tier stylus-equipped model, which LG angled towards a spot on this Phonerated list of the best phablets on the market. That said, the Stylo 4 does not quite have its base model's high-end caliber, at least in terms of RAM count, reducing the Q Stylus's 4GB RAM down to only 2GB . 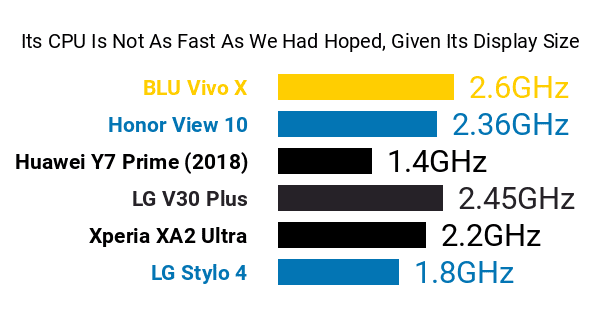 Moreover, it sticks to a so-so (by 2018 measures) Qualcomm Snapdragon 450 1.8GHz eight-core processor -- considering its massive screen, which we'll examine further down this specs-driven review, we were expecting an octa-core chip clock at somewhere north of 2GHz. 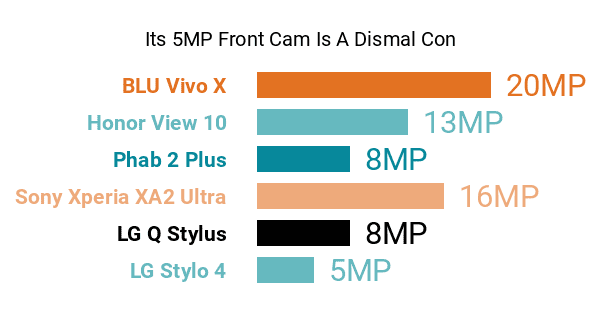 The Stylo 4 also suffers a couple of downgrades on the imaging front. While the Q Stylus offers an 8-megapixel selfie camera, the Stylo 4 comes with a measly 5-megapixel front cam , although it still delivers the Selfie Light display flash function alongside LG's typical suite of selfie cam options, including Gesture Shot and Beauty Shot. At the back, it sports a 13-megapixel primary camera , which is obviously a con, compared to the 16-megapixel main cam of its big brother. Despite the reduced pixel resolution, though, the forenamed rear cam still comes with phase-detection autofocus (PDAF) and the AI-powered QLens visual search tool , AI visual-searching being a typical facet among the best photography phones. On storage duties is a rather unpromising 32GB internal memory that's made forgivable by its accompanying mammoth 2TB memory card slot . The LG Stylo 4's pros are headline by its creativity-driven Stylus Pen , which is accompanied by stylus-based interactions like the Pen Pop 2.1, which allows users to select a set of app shortcuts to become available whenever the pen is popped out. Also joining in is Pen Keeper, a security measure that displays a pop-up message whenever the stylus bay is empty while the phone is in motion. Like a good number of other pen-equipped phablets, the Stylo 4 rocks a large display, in the form of a 6.2-inch 18:9 TFT screen with a 2160 x 1920 FHD+ definition. Its large facade feeds off a 3300mAh battery scoring a little over 15 hours of continuous talk time and an appreciable 21-day standby time . With the DTS:X Surround Sound audio system rounding out its pros and cons, the Stylo 4 winds up as a less-photography-driven alternative to the Q Stylus that retains its affinity for multimedia and creativity.